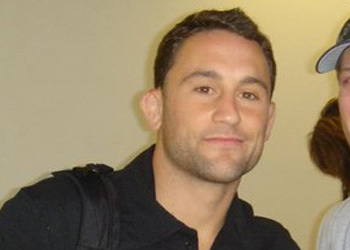 It was only four months ago when Frankie Edgar shook up MMA’s 155-pound division and snatched the UFC lightweight title from around BJ Penn’s waist. Not many people gave him a chance heading into UFC 112, and the odds haven’t changed too much as UFC 118 steadily approaches, but the champ’s all good with that. Not many things have come out of Toms River, NJ outside of the squad that captured the Little League World Series back in ’98 … until now. Edgar’s a scrapper to his core and he’s had his sights set on becoming the planet’s top dog ever since turning professional four-and-a-half years ago. “I think that any competitor’s main goal is to be the best and to have that belt around your waist. I guess that signifies that you are the best,” Edgar told 5thRound.com of his hardware. If you haven’t had a chance to get to know “The Answer,” he’s one of the most unassuming guys that you’ll ever meet. To say the Jersey boy is a ‘regular dude’ would be an understatement. So needless to say, he didn’t allow his new-found superstar status to balloon his head. “I mean, of course I’d like to think of myself as the best but it is about match-ups. Sometimes it comes down to that night which guy’s going to be the best,” stated Edgar. “Lightweight is such a talent-rich division, not only in the UFC but worldwide. Do I consider myself number one? In my head, yeah I do, but there’s always that talk about who’s better, which organization’s champion is better. Even though he’s coming off the biggest win of his career, the soon-to-be 29-year-old admits that not much has changed as he approaches Saturday’s mulligan with the Hawaiian. Although, he did leave Abu Dhabi with some irreplaceable mojo after beating the man who was widely regarded as the best lightweight of all time. Make sure to check back with 5thRound.com this UFC 118 fight week for more exclusive coverage of the 155-pound king.